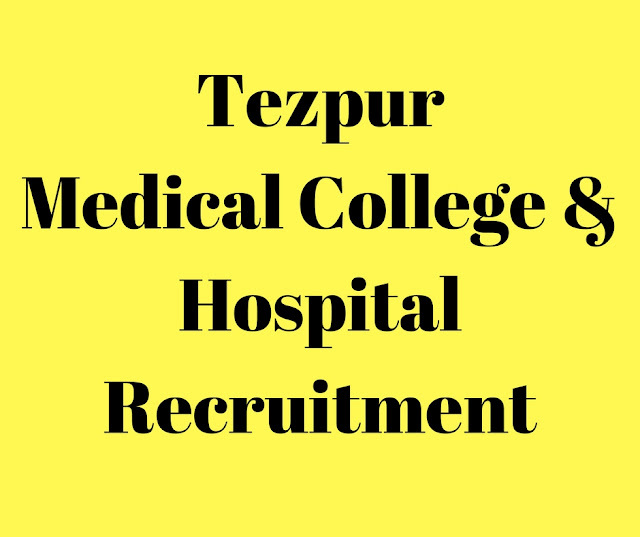 A walk-in interview will be held as per details given below Tezpur Medical College & Hospital Recruitment 2017 for one post of JRF/SRF and one post of Lab Technician. These posts are vacant in DBT, GOI-funded research project "Genomic analysis of HLA and Non HLA genes and humoral profile of Type 1 Diabetes Mellitus in the population of North East India" in DBT's Twinning program for NE. I have discussed below details of advertisement and other information such as, eligibility criteria, age, project duration, number of vacancies, application process etc. The advertised posts are purely temporary for the duration of the project and subject to availability of the funds from DBT. For NET qualified JRF/SRF @ Rs 25,000/- +10% HRA for the 1st & 2nd year; [email protected] Rs 28,000/- +10% HRA for 3rd year. For non-NET qualified JRF @ Rs 12,000/- + 10 % HRA for the 1st two years and [email protected] Rs 14,000/- + 10% HRA for the 3rd year. JRF- Post graduate Degree in Basic Science with NET qualification or graduate degree in professional course with NET qualification or post graduate degree in professional course. Age limit: Upper age is fixed 28 years for the posts. Relaxation in upper age limit of the candidates belonging to SC/ST/OBC shall be provided as per the Government of India rules. H.S. (Science) with Laboratory Technician certificate course from Govt. Medical College/Institute. Age limit: Your age should not be more than 28 years. Prof. (Dr.) Roonmoni Deka via email [email protected] with the subject line marked as “Project Position-DBT Twinning Project for NE”. Under-qualified and over-aged candidates will not be allowed to attend the walk-in interview. The date for determining the upper age limit, qualification etc. will be the date of walk-in interview of the respective Post. Accordingly, candidates awaiting for their results for the desired qualification (s) are not eligible to attend the Walk-in interview. Copies of certificates & mark sheets in proof of qualification (HSLC onwards), age, experience and testimonials etc. along with the original of each of it.